When you're in casual clothes all week long, it's lovely to get dressed up to go out. No matter where I'm going I always make an effort and wear a dress. This is probably because I get out so infrequently - it's a big deal! Today I'm sharing with you my most favourite going out dress which I bought in a sale in a small boutique in Tipperary. It's a wool shift dress, fully lined, with beautiful detailing on the shoulders and neckline. My sister, who lives locally, told me to make sure to ask for the 'recession' price and not to mind the price on the tag! It was reduced to €60 in the sale but I had only €40 cash in my purse. So I took the plunge and asked the owner if she would she take €30 for it and we shook on €35! Result. I always wear with my 100 denier tights from M&S and my M&S Autograph Shoe boots. The link is to this year's version of the boots. I can't find anything similar to this dress online but if anyone does, please let me know in the comment box below. 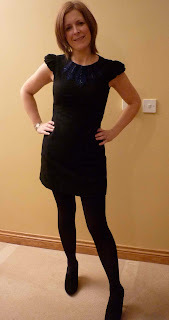 I did find this gorgeous ASOS dress though - a classic, flattering, LBD. ASOS are great to buy from, they accept Paypal, have fast, free delivery and free returns. And you never need leave the comfort of your home. Claire's been in touch this week, this time with her favourite Sat Night dress. Thanks for emailing me on schoolgatestyle@yahoo.co.uk! Loving this Matalan Clutch & Warehouse dress. It's now out of stock at Warehouse but they do have a great selection worth looking at and have 20% off all their dresses this weekend. Claire's shoes are from Moda in Pelle past season. Have a great Saturday night whatever you do. Oh, and I'm running a competition tomorrow so watch for my Sunday blog for full details!